The fact that there’s widespread support for spending caps from groups that support limited government is hardly a surprise. After all, we have lots of real world evidence that limits on the growth of government spending – if sustained for multi-year periods – can quickly shrink the burden of government and reduce red ink. So the real key is figuring how to impose rules that ensure long-run spending restraint. That’s why, for instance, the Swiss Debt Brake is attracting so much positive attention. But what’s really remarkable is that there’s also growing support for spending caps (sometimes called “expenditure limits”) from establishment organizations that normally lean to the left. I’ve already highlighted how both the International Monetary Fund (twice!) and the Organization for Economic Cooperation and Development have acknowledged that spending caps are the most, if not only, effective fiscal rule. By the way, these international bureaucracies are not motivated by a desire for limited government. Instead, they focus on fiscal balance. In other words, they want to control deficits and debt, which I think is a misguided focus since red ink is merely the symptom of the real problem of excessive spending. Yet regardless of their focus, research from the IMF and OECD has shown that spending caps are the only approach that works (hardly a surprise since symptoms go away if underlying problems are addressed). Now we can add another establishment voice to the chorus. The European Central Bank (ECB) has just published a study on the efficacy of fiscal rules for countries in the European Union. Let’s look at some excerpts to see what was found. First, it was discovered that balanced budget rules aren’t very effective since they allow too much spending when the economy is growing and generating lots of tax revenue. Moreover, such rules are difficult to sustain during downturns when revenues fall. …during a boom phase fiscal rules do not prevent fiscal policy from turning expansionary, while at times of a recession fiscal policy is potentially restrictive as governments need to comply with the rules’ requirements. This effect is assumed to be particularly pronounced in periods of limited fiscal space, while it might be less obvious in an environment of high fiscal space. By the way, “fiscal space” refers to the maneuvering room politicians have. A government with a budget surplus, for instance, has “fiscal space” under a balanced-budget requirement. But if a budget is balanced, then a government doesn’t have “fiscal space” if something happens (like a downturn) that causes lower revenues and higher spending. Anyhow, the ECB study found that expenditure rules were the most effective. We find strong evidence for fiscal rules being associated with higher fiscal space, i.e. the fiscal room for manoeuvre is higher in those countries which have established fiscal rules. This may not be surprising as fiscal rules are implemented to keep primary balances under control… When splitting the results by different types of fiscal rules, we find significant coefficients for expenditure and, to a lesser extent, balanced budget rules, but none for debt rules. Here are some of the details about spending caps. Regarding the different types of fiscal rules, we find particularly strong coefficients for expenditure rules, possibly reflecting the fact that expenditure rules are easier to monitor and are thereby more credible. …If a country had a fiscal rule in place for the past ten years the average fiscal space for those years is around 22% of GDP higher. The coefficient is proportional to the number of years in which a fiscal rule has been in place. All this makes sense. The longer a spending cap is in place, the better the results. Which may be why more and more nations are moving in this direction. The study highlights a very important reason why spending caps are successful. They make it difficult for politicians (as we’ve seen in Greece, Alberta, Puerto Rico, California, and Alaska) to increase spending when there is fiscal space (i.e., extra revenue). Last but not least, the study also generated some findings that should be of considerable interest to fans of Keynesian economics. These are the folks who think an extra burst of government spending can stimulate an economy, so they are strongly opposed to balanced budget rules that are perceived to be “procyclical” since they require belt-tightening when there’s a recession and revenues shrink (while also allowing more spending when the economy is strong and revenues are growing). But as you can see, spending caps generally avoid this problem. …an increase in fiscal space indeed seems to be associated with fiscal policy being more procyclical. Yet if fiscal rules are in place, this positive link seems to be significantly smaller. …balanced budget rules…and expenditure rules…are correlated with a lower coefficient for fiscal space on procyclicality. This is in line with our findings above that expenditure rules might restrict discretionary expenditures. This makes perfect sense. If you look at what’s happened with the Swiss Debt Brake (which is actually a spending cap), government spending has increased about 2 percent annually. That’s a frugal approach when the economy is growing and revenues are increasing, so advocates of small government can applaud. But when the economy is weak and revenues are flat, Keynesians can applaud because government is still allowed to grow by 2 percent each year. And since spending grows by less than the private sector over the long run, the net result is not only a smaller burden of government spending, but also shrinking debt levels, which is why we’re also getting applause from the OECD, IMF, and now the ECB. P.S. Not all spending caps are created equal. There are very successful spending caps in places such as Switzerland and Hong Kong, in large part because these caps are explicitly designed to keep government from consuming ever-larger shares of economic output. But I was recently in Texas as part of a program to discuss spending caps, organized by the Texas Public Policy Foundation. 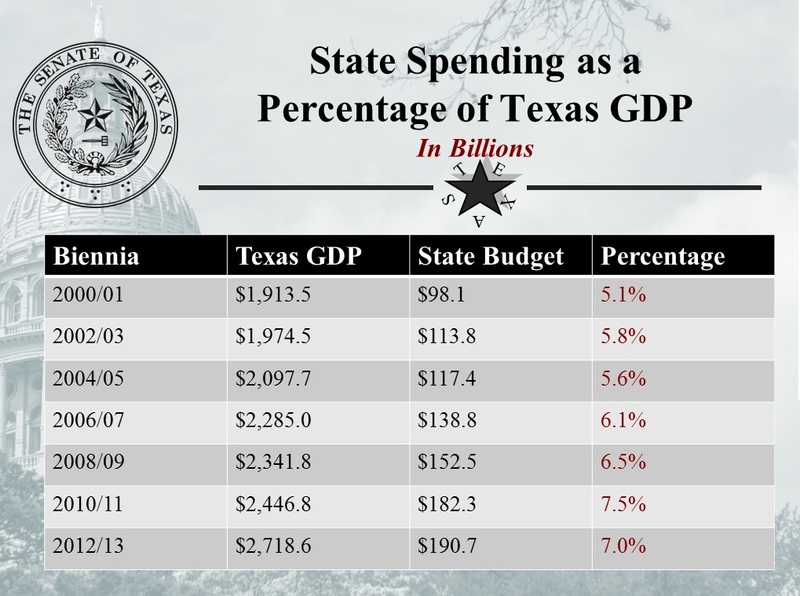 Texas has a spending cap, but as you can see from this slide presented by State Senator Van Taylor, it’s not exactly working as well as the Swiss Debt Brake. You can watch a video of the event by clicking here. My message was that a spending cap is like a speed limit in a school zone. If the limit is 90 MPH, it doesn’t do any good. The goal – at the very least – should be to prevent government from consuming ever-larger shares of economic output. This is the giant challenge in the developed world.